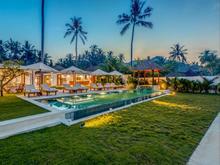 View and book from over 4 villas from 558 AUD per night. Book with peace of mind with our Price Guarantee and local customer support. Located beachfront on Bali's east coast, this gorgeous 4 bedroom beachfront villa is a perfect spot for a seaside holiday with your family and friends. Tucked away in the small fishing village of Sengkidu, this villa offers you a paradise with the clear cool deep blue sea is only a few feet away. Situated in the amazing Amuk Bay, one of most beautiful places in Bali, this villa is only a few minutes by car from the village of Candidasa.